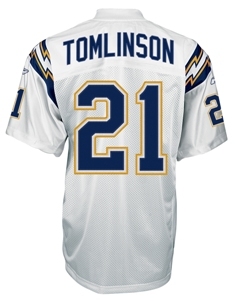 Former MF-cover guys LaDainian Tomlinson (November 2007) and Reggie Bush (September 2007) have the two top-selling jerseys in the NFL this season, according to Reebok, the official outfitter of the NFL. Chicago Bears linebacker Brian Urlacher comes in third on the list, followed by three legendary quarterbacks: Peyton Manning, Brett Favre, and Tom Brady. Bushy-haired Steelers safety Troy Palumalu ranks 7th, followed by last year’s offensive rookie of the year, Titans QB Vince Young (8th) and rookie sensation Adrian Peterson (9th). Randy Moss’s New England Patriots jersey rounds out the top 10. For an inside look at what how Adrian Peterson trains, make sure to pick up the February 2008 issue of Men’s Fitness, on sale soon!